The Night Before Christmas is a fun exciting night for adults and children so why not add to the fun with this festive piece? 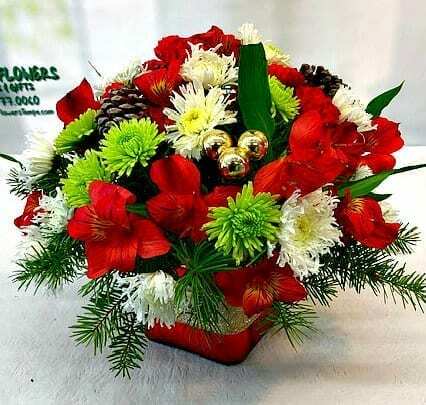 Placed in a festive red cube its filled with sunset red Alstomeria, cream white Mums, and vibrant geern Athos Pom. Complimenting these fun colors are some pinecones, gold decorative balls, and Christmas greens! This will brighten your Christmas Eve and day!